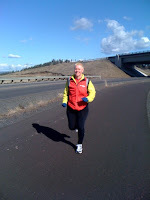 Warrior Marathon Runner: Spring has sprung in Spokane!!!!!! Spring has sprung in Spokane!!!!!! It is spring weather here in Spokane this week. Ran a killer 8 mile hilly run south of Spokane on Thursday after work and it was wonderful! It is an area called Regal Road that is out in the country and one hill after another. Had a great 5 miler this morning. Two weeks until the Rock N Roll Dallas Half Marathon where i am one of the keynote speakers at the pasta party. Got my speech all approved from the main Komen office in Dallas and ready to present. Everyone have a great week and enjoy life!!! !